A couple left the water cache by torchlight at 4:31am. I know this because I heard them but didn’t recognise Vortex’s voice. Had I done so I would have said hello from my spot behind the bush, and probably shocked 1000 calories straight out of them. But I let them go and waited for more light. With 5 litres of water the climb to Tylerhorse Canyon was really hard. I was out of breath and stopping every minute or two. It may have been yesterday’s excess that caused it, what ever the reason I was struggling but perked up when I saw Vortex and Blue Sky because it’s always nice to have friends around. I ate a whole box of fig newtons for a snack, thats 770 calories and I was still hungry. Up and up the hill went, and so hot. There were lots of dirt bike tracks and according to the guide book it is the riders that are responsible for all the missing signs up there. At the first plateau after the snack I would have wandered off-trail if it hadn’t been for Yogi’s note on the ground. Looking carefully I could see the stump of a trail marker that had once told hikers to turn left. In a dry section on a hot day that sort of stuff could be really dangerous. Once we reached the ridge the “undulating traverse” began. Mostly shaded it would have been an easy walk if it wasn’t for the dirt bikes that have shaped the trail into a series of humps and troughs 6ft across and a couple of feet deep. Blue Sky said it best: “I didn’t expect the undulations to be so small”. 17 miles by lunch, a 4 hour nap and on with the day. I began to see logs laid across the trail, to stop the bikers using the PCT, which was a good idea but I thought that since logs/rocks have also been used to cut off side trails and keep hikers on track it was going to confuse someone. It confused me. At one particularly crucial junction I stepped over a log thinking that it really looked like a block for the hikers but since the trail was on the other side I’d continue. And continue I did as the path got sandy, steep and there was now only one set of footprints ahead. It was about 10 minutes before the tread disintegrated too much and I made the call to turn back. Vortex and Blue Sky were a few minutes behind me and came back up a way then stayed put while I made sure I could find the trail again. I did and they caught up quickly. We stuck together after that. In the final mile we ran into Chris and Carol (Bucksnort and Lupin), two section hikers/trail angels, who had come to see if anyone needed a ride to Tehachapi. They even invited us to stay at their place so instead of sleeping at Oak Creek with bad smelling water we ate at a chinese buffet (and I mean reaaaalllly ate, mmmmmm) and got showers and beds to sleep on. Trail magic at its finest. 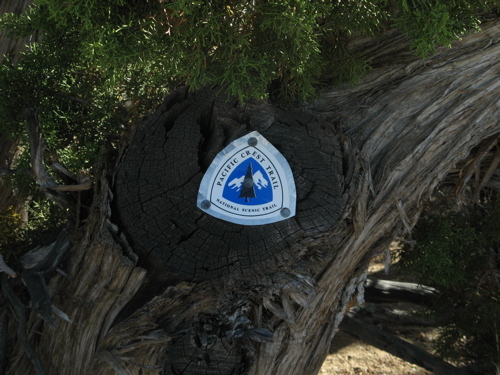 This entry was posted on Sunday, May 27th, 2007 at 6:00 pm	and is filed under California, Hiking, Photo. You can follow any responses to this entry through the RSS 2.0 feed. Both comments and pings are currently closed. Yahoo…No…Where 2.0 conference followed by Google Developer Day, but I promised not to talk about work so you’ll have to wait until October to find out more.